We’ve all been there. Despite all your best intentions to let it all go, sometimes we just break. Taking a deep breath no longer helps. Counting to 10? Forget it. Yoga-smoga. You’re past that. You just want to scream. Towanda! Oh, my gosh. Fried Green Tomatoes is one of my favorite books and movies. I think we can all relate to Kathy Bates character in the movie, Evelyn Couch. This tender-hearted, middle-aged lady wants to show love and kindness to others. She struggles like the majority of women about her self image. She tries to take care of herself, works out to those Jane Fonda videos and eats as best as she can. Evelyn is insanely committed to providing yummy dinners for husband and trying to keep her house a warm, welcome place. As someone who can’t seem to ever get the laundry done, I have great respect for her aspirations. We learn quickly that sweet little Evelyn allows herself to be a doormat in just about every scenario of her life. God calls us to love one another, but He doesn’t call us to be doormats, people. The clip above is one of my most favorite scenes in the movie. It initially reminded me of what it was like waiting for a parking spot in the Zachary lot at Texas A&M before class. My Aggie compadres know exactly what I’m talking about here. To be honest, I didn’t appreciate this scene nearly as much as I should have until after I’d given birth to my little darlings. In my heart of hearts, I long to show love and kindness to others. It’s not a facade. It’s not contrived. Our world is broken enough. How hard is it to smile and offer a word of kindness to another human being? I get Evelyn’s desire to please others. It’s how she shows love. We no longer live in a world where courtesy is common. And isn’t that heartbreakingly sad? Most of the time, I can tell my girls to shrug off when someone hurts their feelers, or when an act of kindness isn’t received as they thought it would be. After all, they’re not seeking approval from others. Rather, my PC (Prince Charming) and I encourage our girls to strive being the person God has called them to be. But sometimes, mean-spirited behavior just doesn’t feel okay. Anyone who knows me will tell you I don’t love to shop. Alas, it’s true. Much to my grandmother and mother’s dismay, something in my genetic makeup was cross wired in this area. What’s worse than shopping? Shopping during the holidays. I’d rather get a flu shot, people. I revisited this clip shortly after this Christmas season, and I had to smile. Then, I immediately thanked God for the impulse control He gave me while out shopping. Somehow, I don’t think PC would have been as good natured as Evelyn’s hubby about accidentally hitting someone’s car five times. Seriously. Thank you to whoever made online shopping possible. I heart you more than words can say. Anyway, my point is that I’m noticing more frequently how less kind people in general are acting toward one another. I pray. I ask God to pour out His grace and that we may lovingly extend that grace to one another. I ask God to give me a heart to be caring even when someone is ugly. It’s not easy. PC and I are honest with our girls about this struggle, too. We’re human, and we live in a broken world. Instead of calling on Towanda the Avenger, the Lord God our Almighty wants us to call on Him. Living in a broken world doesn’t mean we have to be broken people. Towanda makes me smile. I love the image of a fierce heroine who smashes bathroom scales and declares bras must be made from only comfortable, stretchy fabric without wires. 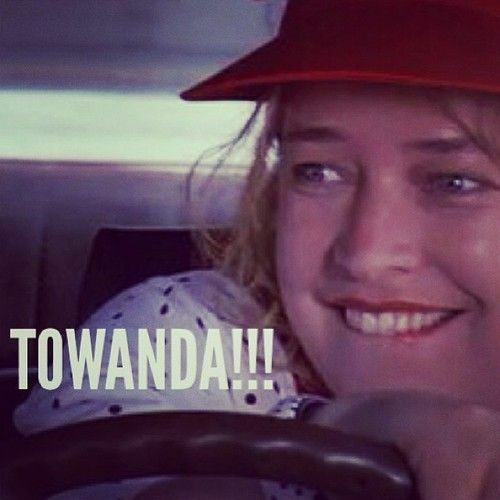 Our God has a sense of humor, so I choose to believe the idea of Towanda makes Him smile, too. But we when we’re done…when we’ve reached the end of our rope…God is our avenger. He alone has the power to hold and restore what has been broken. He has an endless, unfathomable reserve of grace, love and patience that He can and does bestow on His people. Even Jesus occasionally had to recharge his batteries when He was weary. This week, I’m praying for our world, for our society and for common courtesy to be restored among God’s people. Will you pray with me that God will fill our hearts with a passion to love one another? Will you pray that kind acts may be contagious and the good habits will replace hurtful ones? Romans 12: 1-2 is one of my life verses and I have used it many times when contemplating my reaction to unkindness. I will join you in prayer! I love that passage, too. Thank you for praying with me!